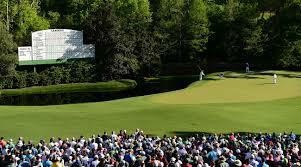 Tough hole No.11 the start of the famed Amen Corner, 11-12-13 will lead to high drama on Sunday. (Photo, Golf.com). The beginning of Amen Corner (holes 11-13), this hole is a difficult, long par 4, that puts a premium on your approach shot. If the competitor misses to the left of the green, he is in the water. A lot of players will bail out to the right and try to get up and down for par. Par is a good score here. One of the most demanding finishing holes in golf, this uphill dogleg right is protected off the tee by two deep bunkers down the fairway to the left about 280-285 yards out. The drive is through a chute between two sets of trees on the player's right and left sides. A middle iron is required on a highly tension filled approach shot. There is a bunker in front and on the right side of the green. Adam Scott birdied here in 2013 from 25 feet and Angel Cabrera followed him up with a birdie from four feet to set up a playoff which Scott won on No.10, the first playoff hole. It was a clutch city performance by both players. Should be an electric finish. The 83rd Masters Tournament has an interesting plot this year. There are no clear cut favorites. There are a lot of very good players in the field with this crop of talent in the game today, but I’m not seeing closers amongst this group. I’m not seeing Nicklaus, Palmer, Player, Watson, Trevino, Ballesteros and Faldo amongst these guys. Rory is that kind of player as well. He seems to not get it done when you think he is going to. Justin Thomas is a great player, but hasn’t proven that he can win more than 1 major. Jordan Spieth is a little out of sorts right now, so you don’t know what you’re going to get from him either. Jason Day, I don’t see him winning. Brooks Koepka has been great at the U.S. Open the last 2 years and also won the PGA last year, but he hasn’t really ever been a factor at Augusta. Rickie Fowler, Don’t see him as a closer in majors. Justin Rose, possibly, but not a super track record at Augusta either. Tiger Woods, possibly, he’s a 4 time winner in 1997, 2001, 2002 and 2005, so he’s got a shot and he was definitely a closer for a long time. But I’m not exactly bullish on him. Patrick Reed , the defending champion, pretty critical of his teammates at the Ryder Cup, which I’m not sure wasn’t warranted, but he’s not playing that well either. Phil, Not out of the question. 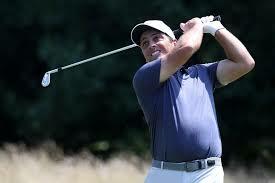 Like Molinari to capture his second major in a year (Photo, Golf Digest). Sunday, Chance for Strong T storms, hopefully not on Sunday at Augusta, Winds 13-18. The Warriors are the favorites once again, but I’m seeing a soap opera out there. Kevin Durant is a bitter, disgruntled player right now, and with Draymond Green, who knows what’ll happen with him and how many technicals he’ll accumulate and maybe cost his team. I see them getting through the west and defeating James Harden, who hasn’t ever proven it in the playoffs, and the Rockets, but I like Milwaukee and the “Greek Freak” Giannis Antetokounmpo, a superb basketball player, who I like as MVP over Harden, to win out in the east over the Toronto Raptors and Kawai Leonard, and with the home court advantage in the championship series, I like Giannis and the Bucks to upset the Warriors. Like the Milwaukee Bucks to hoist the Lawrence O’Brien Trophy in June, the first time Milwaukee has done that since 1971 (48 years) when Kareem Abdul Jabbar was there and was unstoppable and was named Lou Alcinder at the time. Giannis is a force.